A couple weeks ago when I announced we would be accepting select advertisements showcasing small or home businesses, naturally we didn't know what kind of response we would get. One of the first people to contact us was the amazing Tim Young. I've mentioned Tim a couple of times before (here and here). Over ten years ago, Tim and his wife left their urban home and embraced the challenges of homesteading. 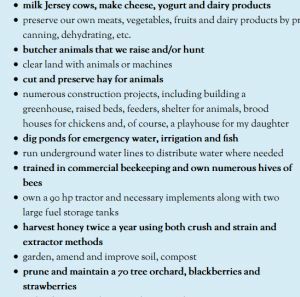 Not just homesteading, but making a living from their homestead ... not an easy thing to do. But these folks rose to meet the challenge and have created a lifestyle that, well, you have to see to believe. I don't think there's anything they don't do, from butchering to beekeeping to making tinctures and medicines to...well, everything. Their website is here and it's worth diving in and exploring all over the place. 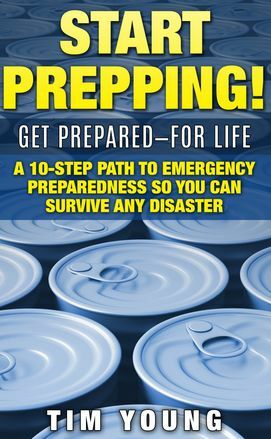 Tim has a new book out entitled Start Prepping which, as you can imagine, covers the subject with the thoroughness and expertise folks have come to expect from someone of Tim's caliber. Tim isn't one of those "theoretical" writers. He's a get-your-hands-dirty kind of guy who speaks with honesty about his success and failures, his mistakes and his triumphs. When Tim recommends something, it's because he's been-there-done-that. This is a book well worth reading, particularly for those who need a nudge in the prepping direction. And for anyone interested in homestead musings, farming nuts-and-bolts, and endless other rural nuggets of gold, Tim Young's website is the place to go. Thanks for the introduction to Tim. I look forward to reading some of his thoughts. I just ordered the kindle version. I took a cheese class from Tim a year ago and he is the real deal! His books are well worth the time and money too! I believe he has sold the farm and cheese business. Thanks for the into! I checked out the website and ordered an older book to get started- planning on returning! A very well written and laid out book. The price for the kindle version is good too.